Sparkly, shiny baubles have a way of brightening my mood. I’ve been known to wear my best items to do housework occasionally, just because it feels good! With the holidays and surrounding festivities coming up quickly, I am eager for new pieces to wear. So I decided to make some! 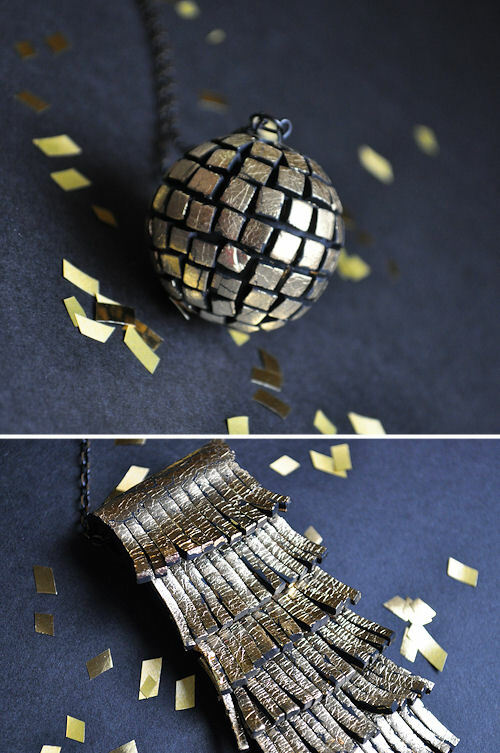 For these pendants, I shied away from the understated and discreet and decide to make something bold and lustrous. Gold is making a comeback and it is definitely shiny. Think these look too hard to make? They are totally doable. I mean it. 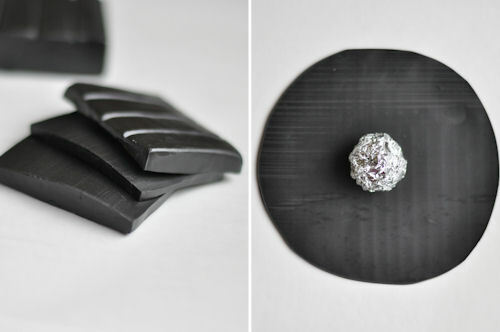 Polymer clay is a very versatile medium, the possibilities are seriously endless. 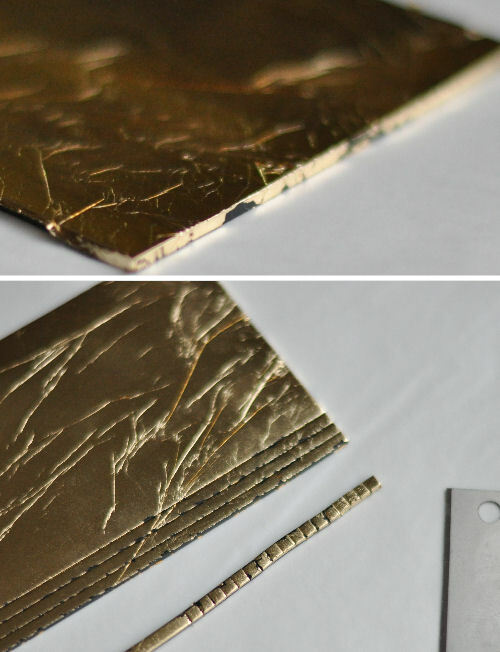 Add that to how easy it is to manipulate, all the various finishes it can have and how it sticks to itself without glue — and creating things with it is pure fun! 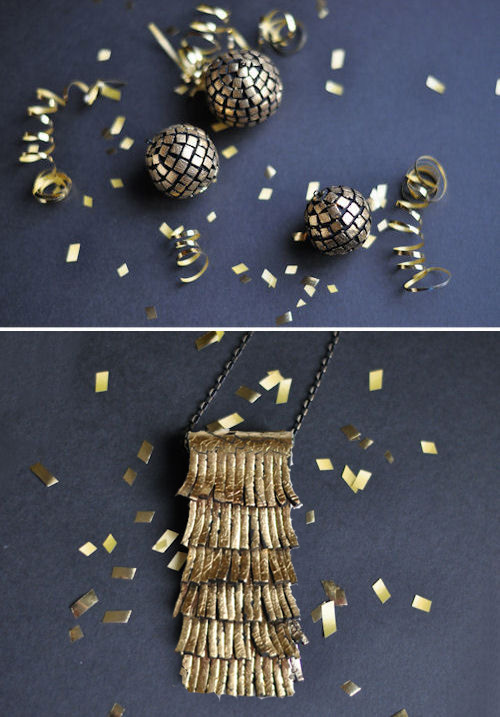 I’m really digging the black and gold trend right now and, as I mentioned, the gold is perfect for adding some shine to your holiday party apparel. 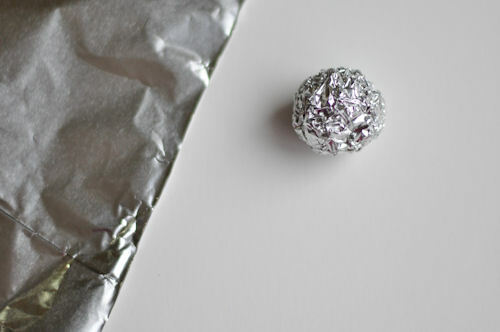 Begin by pressing the aluminum foil sheet into a tight ball. Work to get it into as good of a sphere shape as you can. My foil piece measured 8 inches by 8 inches and created a between 1-1/4 inch ball. The foil center keeps the pendent light-weight. Condition the black clay by first slicing the block in four thinner chunks and passing it through the pasta machine until it is supple. Then pass the clay sheet through the machine at setting 4. 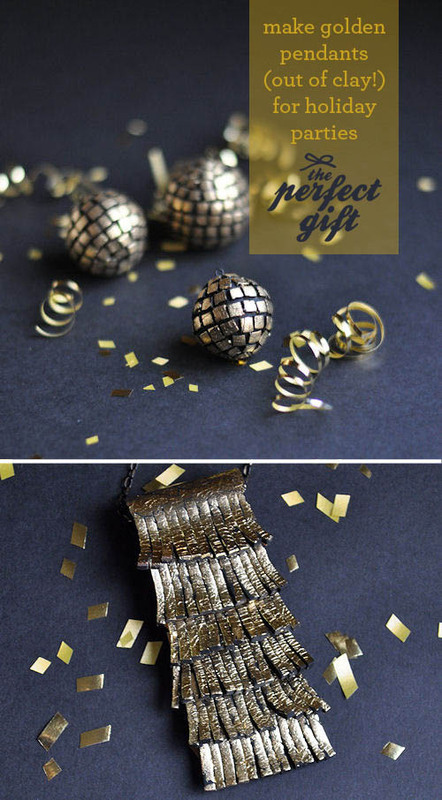 Place the foil ball on the clay and cut a circle large enough to wrap around the whole surface of the ball. 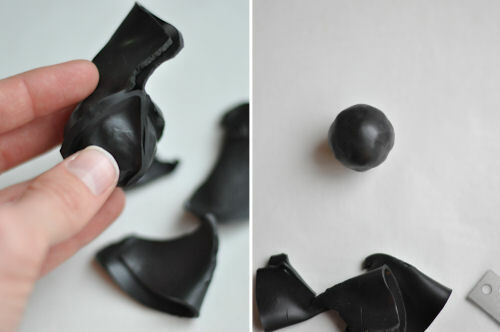 Fold and press the clay around the aluminum ball creating four seams. Make sure to pinch the seams together at the top of the ball as well. Make sure the clay is formed tightly around the ball. 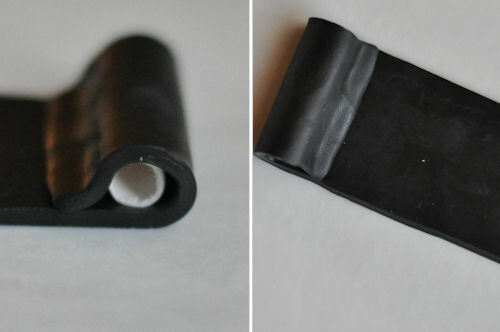 After the seams are pressed, remove the extra clay with the straight blade and use your fingers to smooth the seams. Next, place the eye pin straight through the clay ball. The awl might come in handy at this point. Try to skewer the ball as straight as possible. 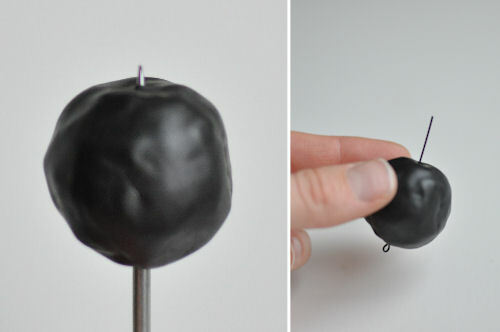 Once the pin is placed, curl the bottom of the pin and tuck into the ball. 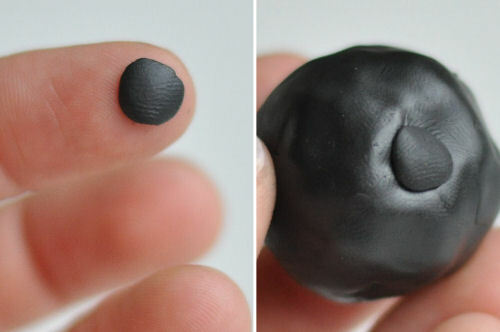 Take a small dot of clay, flatten it with your fingers and place it over the hole where the eye pin sits. Smooth out with your fingers. Roll out another piece of black clay with the pasta machine again set at 4. Gently press a piece of gold leaf to the top of the clay. 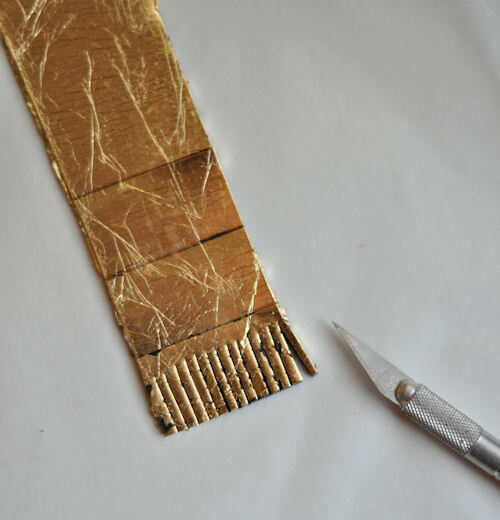 With the straight blade, cut narrow strips and from the strips, cut small squares. 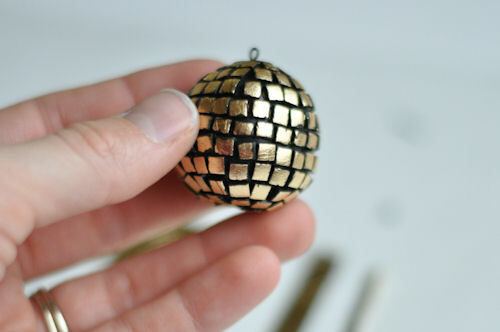 Begin sticking the small squares to the ball. I found it easiest to start in the middle and work above and below that median line. Cover the whole ball with the small squares. Then bake it for the recommended time and at the recommended temperature based on the manufacturer’s instructions (you’ll find them on your package of clay). 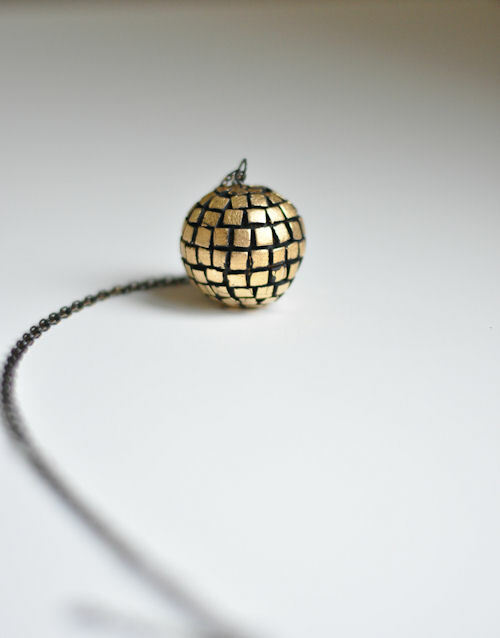 When the ball pendant is cured and cooled, add a jump ring and a chain and it’s ready to wear. 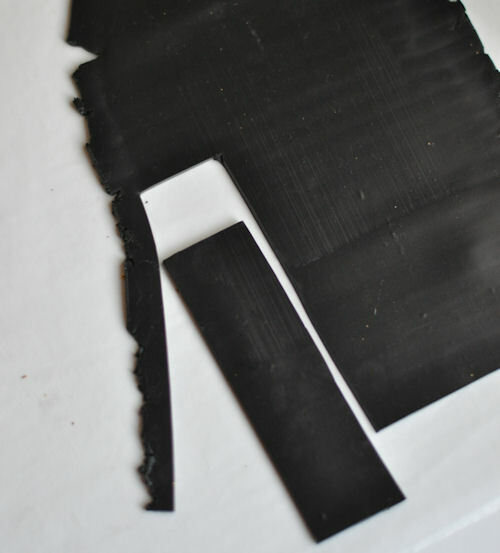 Condition the black clay through the pasta machine by first slicing it into narrower blocks. Continue conditioning it until it is soft and supple. Then cut a rectangle from the clay for the base of the pendant. Mine is 3 3/4 inches long and 1 1/4 inches wide though it would work at any size. Cut a length of the paper straw just narrower than the rectangle strip. The straw will add some extra support for the clay as it hangs on the chain. 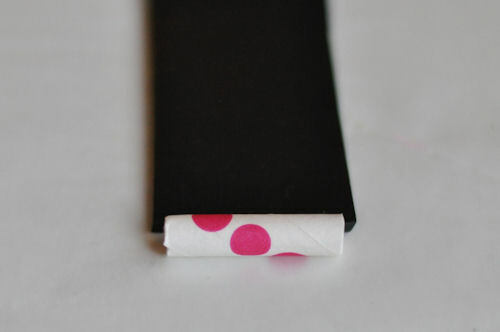 Gently coax the clay around the paper straw and tuck it in tight. Make sure the looped clay makes a good seal to the backside of the pendant. Roll another sheet of polymer, this time at setting 6. Cut a second rectangle from the rolled clay, longer and wider than the first. 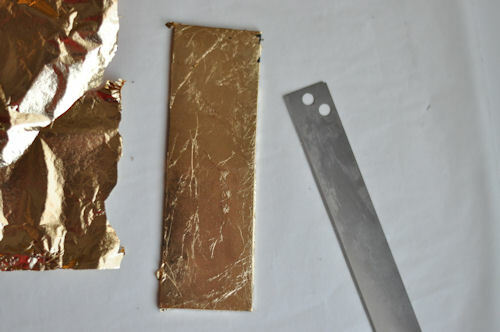 Lay down a sheet of gold leaf on top and press it down gently. Remove the excess. 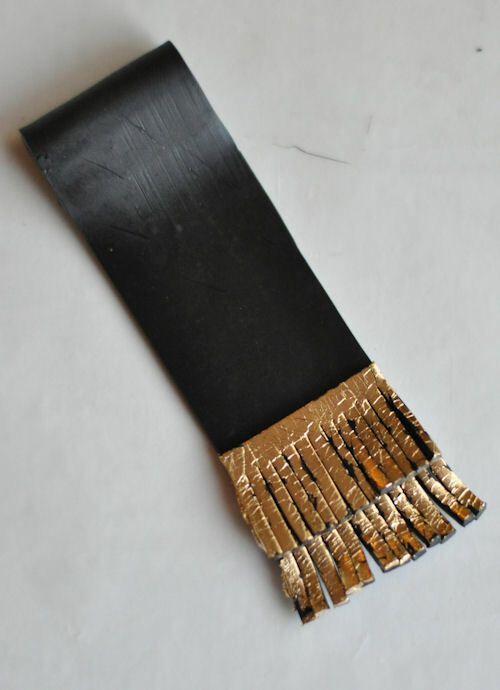 Begin by cutting rectangles in the gold leaf clay with the straight blade. Then, using the X-acto knife, cut fringe. 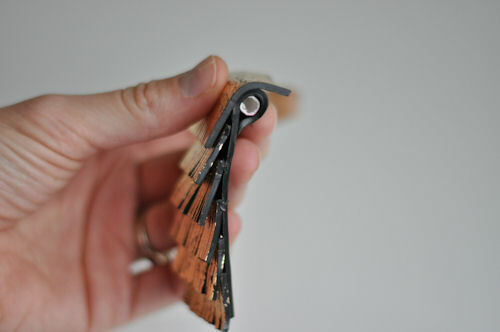 The X-acto knife is wider than the straight blade and separates the fringe from each other a little better. They do get stuck back together but it’s easier to separate them with an X-acto cut. 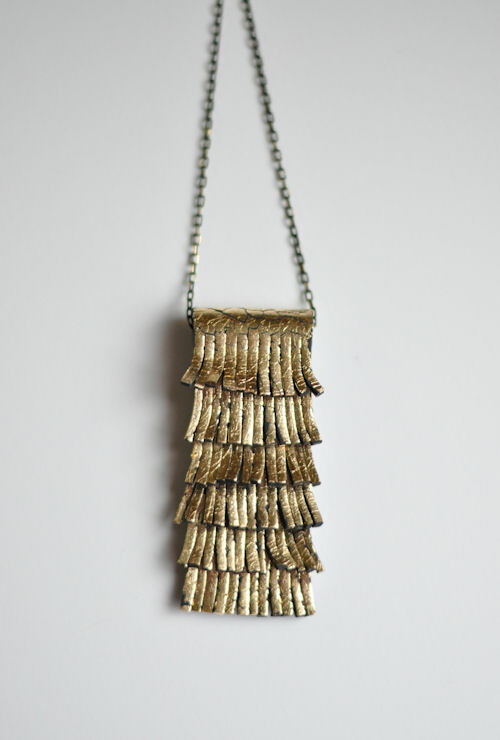 Starting at the bottom of the pendant, place one of the fringed rectangles on the base rectangle, with a little part of the fringe hanging over the bottom edge. Trim off the excess on the side. 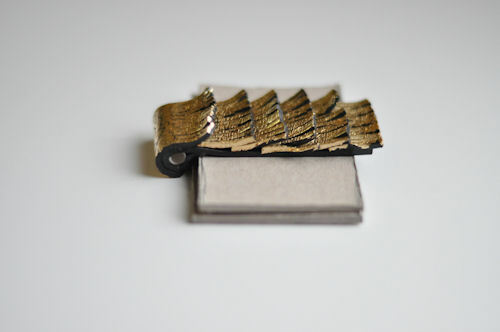 Layer on the subsequent pieces just high enough to cover the unfringed top area. Continue on until you get to the top. 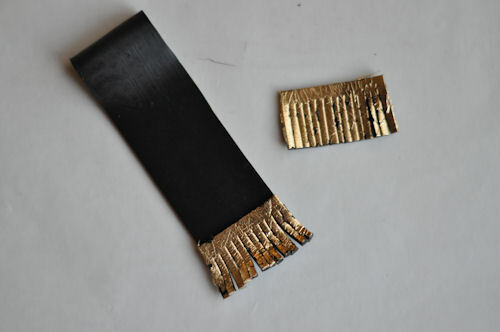 For the final piece, cut a taller rectangle but cut the fringe the same height as the rest. Stick the piece down and work to curve and bend that extra long piece around the top of the pendant and on to the back side. Once all the pieces are in place, fix any fringe you would like. 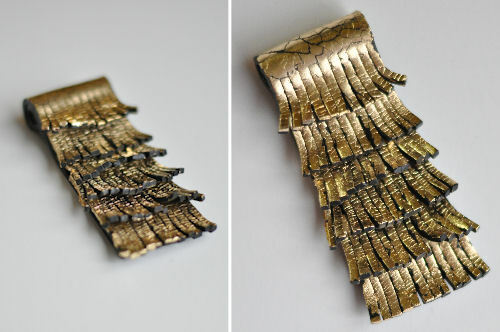 Note: very curved and flippy cured pieces can be damaged during wear. Moderate ‘fringy-ness” is better. Bake it for the recommended time and at the recommended temperature based on the manufacturer’s instructions. I baked mine atop two pieces of cardboard. 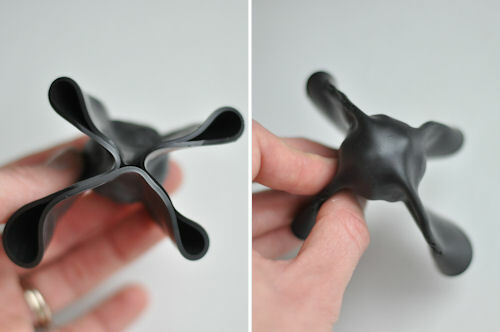 It’s not necessary but it helped keep the pendant’s shape. When the pendant is cured and cooled, loop a chain through the hole and that’s it. 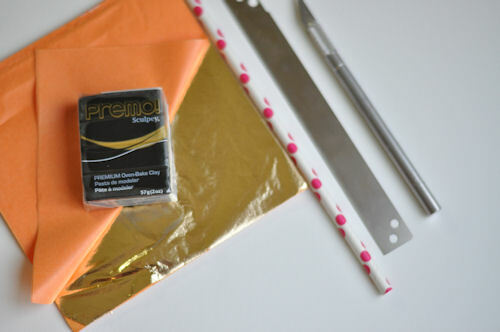 So put on your party dress (or your house-cleaning clothes) and add a little goldy shine! – Make one for each bridesmaid in your wedding party. 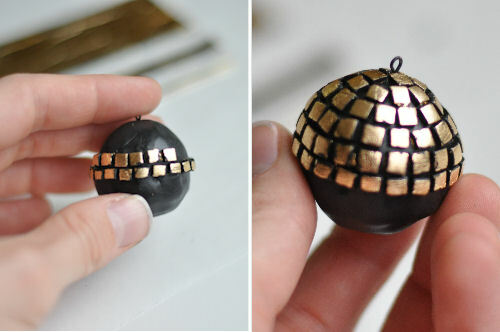 – Put the disco ball on a key chain and give it as a party favor for a New Year’s Eve party. P.S. — We love making gifts! You can find all the posts in this series here. 1) This is awesome. 2) In the most gentle way possible, it’s “bauble” and “discreet”. Thanks for the ideas! Oh my goodness, thank you so much L!! So sorry for those grammatical errors!! Yikes! Fantastic technique! 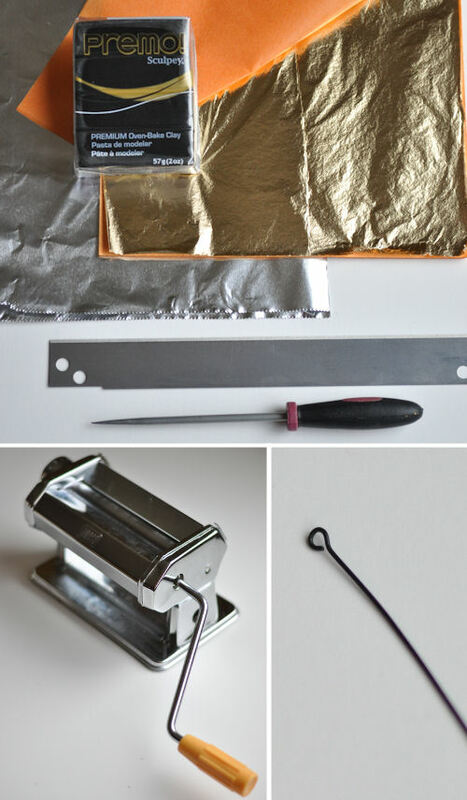 I never thought of using foil as an armature. Kudos! I love your tutorials! I am brand new to polymer clay and have a lot to learn. 1. 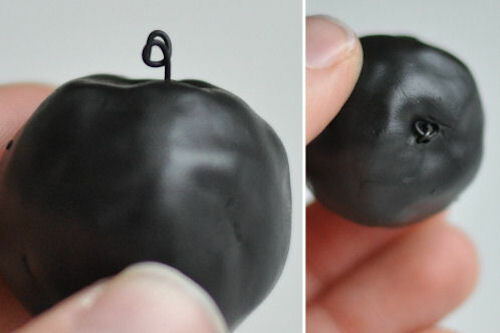 Is it dangerous to bake polymer clay in my oven? 2. Sould all tools be used only for the clay? 3. What is the best thickness for pendants? 4. What is best to seal and make the clay shiny?